Film and music festivals, awards, conference and other event organizers of all sizes in over 40 countries with more than 390,000 users worldwide. Join the Eventival family and contact us for a demo. 3 tiers of pricing dependent upon features. Pricing listed in Euros. 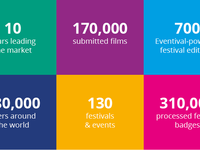 Eventival handles the entire FESTIVAL life cycle: from the call for submissions through reviewing, selection and scheduling (films or artists); all aspects of the hospitality and accreditation process, to the preparation of festival materials and web synchronization. Are you NOT a FESTIVAL? Select only the features you need, whether it is delegate & participant registration, event invitation management, or simply an indispensable contact database with mass mailing, searching and exporting. Pros: We really appreciate using Eventival in our daily work, and the fact that it helps us saving time, nerves and money. Thanks to the fact that it combines all needed futures in one software, we have implemented it so far in several teams, like the guest management team (where Eventival helped us improving contacts with our guests, while providing them with information on a regular base without writing thousands of individual emails); the film programming team (starting with collecting of submissions till quick, easy and error-free scheduling of screenings and events incl. individual plans for location managers, guests and moderators); the event team (where the easy and clear invitation process for the opening and award ceremony makes us every time feel sure that we haven't forgotten anyone and the room will be full) and the accreditation team (where we even were able to collect handling fee through the Eventival!). We appreciate the fact that the software has been constantly developed and enhanced with new functions, while on the other side it can be easily adapted to individual needs of every event organiser. Last but not least we would like to mention the exceedingly friendly, enthusiastic and patient support team which makes you feel very safe in every matter. Cons: So far, we haven't found any but we have an advice: Be sure to invest enough time and energy in a proper training. Once you understand how the software works, using it will be very simple. In case you have the chance to be trained in Prague at the Eventival office - go for it, it will bring you both, a lot of knowledge and fun. Overall: The LET'S CEE Film Festival is one of the fastest growing festivals in Austria, with 162 films, nearly 400 screenings and around 150 film guests only during the last edition. We somehow managed the first editions with a lot of Excel sheets, emails, phone calls and meetings, but immediately after implementing Eventival we experienced the huge difference in the speed and clarity of our workflow. For a long perspective you simply need a good tool to make your and your team's life easier. Not to mention the tireless efforts of Tomas and his team to keep their customers well informed and connect them with each other during several festivals they attend. Conclusion: With Eventival we have found not only an effective, reliable and proved festival software but also new festival friends. After three years of using Eventival we cannot live without it! Overall: Overall, the Eventival software is fantastic. It has streamlined many of our basic festival operations in year 1 of our adoption, with many of the more granular operations expected to be streamlined in year 2. Being able to query the database and then export pretty much anything that you need for web or print design/marketing within a few minutes of knowing the requirement. Being the first festival in Ireland to adopt the software, we faced a lot of unfamiliarity from our local film community. Now that we have had it in use for a year, much of the customer support issues we faced in 2018 will not be present. The cons I have found with the software are minor compared to the overall pros obtained by continued and widespread use in our team. The software itself is massively thorough, which can lead to an inexperienced/less than technical user being overwhelmed, but the Eventival team are aware and are continually updating and improving the end user experience of the software. Having Eventival is like hiring a professional Festival Organizer. Cons: Sometimes is difficult to work with Eventival due to internet connection. We have a large team and sometimes we have up to 30 persons working in the same time and the internet can became a problem. Overall: Eventival is a must tool when organizing a film festival or any sort of event. 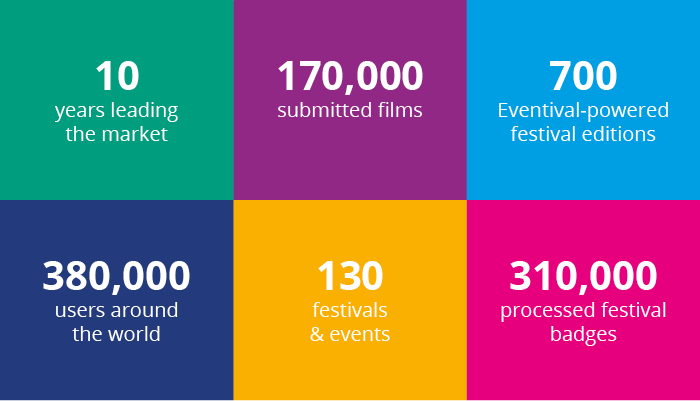 Developed to cater for the needs of various departments within a film festival, the database has improved a lot in the last years thanks to the imput its creators receive from their partner festivals. Eventival has a user-friendly interface which invites you to explore and does not intimidate as databases usually do. We at TIFF cannot imagine what would mean to organize an event so complex as a film festival without a tool of this kind. Recommendations to other buyers: Make sure you have a proper training with your staff before starting using it. We invested in a Eventival Guru in our team and all the issues are managed by him directly with the Eventival staff. Also make sure you have a reliable internet structure in your office. Pros: It streamlines the festival management and enables staff to seamlessly see what's going in programming, guest services, events, marketing and administration. Eventival is easy to configure and the support and training is stellar. Cons: Because this software is so comprehensive, it can be challenging to unleash all its features. Overall: We were in dire need of a system. So we did our due diligence and vetted festival software and we unanimously settled on Eventival because of its 360-degree view of managing a film festival. Eventival enabled our programming, events, guest services and marketing to all work in ONE system. We can't wait to unleash even more functionality for next year. What's a huge plus is the Visitors Page where filmmakers, talent and VIPs can see their itinerary, RSVP to events and check their schedule. What makes Eventival stand out is its documentation, training and support. We've always gotten our questions answered in a timely manner. Eventival has been very open about accepting suggested feature enhancements as well. I definitely, definitely, definitely recommend using Eventival if you're a film or any type of festival that's going through organizational pains. Recommendations to other buyers: Read the documentation. It's extensive. Pros: Eventival is a very diverse festival management software and it really does have almost all of the functions our festival needs. Since working with the Eventival team they have been extremely supportive to our festival helping us to develop new functions and integrations in order for our team to get the most out of the program. It has helped our team to drastically cut down on documents, and allows us to work whenever and wherever we want all the while maintaining access to our database. Cons: It is a big system and takes a while to learn the full functionality of it's features. If staff are constantly rotating it also makes for a difficult time training new staff on the features every year. However this is a positive thing too as it just shows how vast and capable the system is. Overall: A very positive experience with a big learning curve, but it was definitely worth it as our organization has improved ten fold and our communication with our guests has also improved drastically! A great production tool that makes the exchange of information fluid and easy. Perfect software to increase the work efficiency! - Easy interface and the best possible customer service. Cons: There weren't any features we found problematic. Overall: We are organising an international educational project Art Department Masterclass. Eventival helped us to increase our work efficiency on daily basis. We used this software to prepare customized application forms, send mass personalized newsletters to our partners and former participants. It's also a very convenient tool to measure the growth of the project - all the registered users are automatically included in the contacts database. Eventival is an incredibly useful tool, its features seem perfectly suitable for organising film festivals and trainings, although I'm sure there are many other areas where this software would be useful. The system makes us more confident as a festival! Comments: After three years with Eventival, we cannot imagine working without it anymore. Vilnius FF would highly recommend it! Pros: that is specially made for film festivals and reflects the needs from organizations. Cons: It could be more user friendly. Overall: Since 2010, when Vilnius IFF 'Kino pavasaris' started collaborating with Eventival, our festival has increased in both size and quality. There is no doubt that this platform had and still has a significant role in such expansion. Such technology allows programmers, guest managers and other team members to submit, extract and customize their information in a more efficient way, therefore saving time for genuine film festival work: watching films, communicating with distributors, directors, organizers, etc. Eventival puts us one step ahead in digital connection with the audience. It's one system to connect them all. Pros: Overall the best platform of it's kind! Overall: We have been using Eventival pretty much since it's inception and it's become a essential tool for managing our festival. It has EVERYTHING you need along with stuff you didn't even knew you needed. The team behind it also has one of the best customer services available which is useful in the beginning as it can be a bit overwhelming at first. But as soon as you get a hang of it, it is super user friendly. It is also very adaptive to your needs whether you're a bigger or smaller festival and the connection to Cinando is invaluable to a film festival like ours. The best event management software ever! Eventival - useful and unique! Overall: We started using Eventival from the beginning (2008/2009) and we have seen grow it year after year. The support team is fantastic and listen to the suggestions of all customers to try to improve the software. Today we consider it indispensable for our festival also for the jury form that they have created for us. Eventival simplified all the festival departments life and it helps us to save a lot of time. It's a web based software and this is extremely useful because allow us to work from different places been always connected. TSFF + WEMW = Eventival! Overall: Since we start using Eventival we must recognize that it simplified a lot all the festival departments life. It helps us to save a lot of time, organize all our data and it easily links them together. When we started using it last year, at the beginning it meant a big change for us, but Eventival team offered a very useful support with all the question / problems we had. After one year they are still available all the time and it makes the difference. The fact that is web based is extremely useful because allow us to work from different places been always connected. Only Eventival could do this for us. Pros: It's easy and comfortable. Overall: We began to use Eventival when, besides organising the three-month music festival JAZZINEC, we created JAZZ WORLD PHOTO, an international photography competition. We were looking for something that would facilitate the registration and categorisation of the applicants and accepting photographs into the competition, but that would also be a communication tool facilitating independent deliberation of the jurors, production of the gala evening and, in the next stage, organisation of our travelling exhibitions. All this can now be done with ease and comfort. Most importantly, Eventival fulfilled a rather exceptional request we had: that none of the jurors and voting organisers would have access to the current data as long as the application period for the new round is running, This was necessary in order for the compete neutrality of the jurors. Only Eventival could do this for us. Pros: Easy to learn and master, many modules to choose from, saves time and work, great and immediate support from the provider. Cons: It seems to be a bit challenging at the beginning. Overall: Prague European Summit is conceived as a platform for a high-level strategic debate on the future of the European Union and it is very important for us that the logistics and all related activities were smooth and flawless. The registration for the last year of the Summit was carried out through the Eventival management software that helped us to handle a registration process for the conference to a large extent. We had used such a registration system for our conference for the first time and had been very satisfied how it worked. Even though it might seem to be a complex and complicated system at the beginning, we have to admit that it has really eased our event management process and eliminated any mistakes that would have occurred when registering through emails or other common way usually used for such events. Especially, the transport and accommodation module had done a great deal of work for us and saved our time. Every year we are taking much better advantage and nowadays it is an essential working tool. Comments: I've been using it quite a lot to send invitations for film festivals. The search queries are not too intuitive at first, but once you understand the logic of it, it's a great tool. Pros: The overall oversight and supervision of the different departments in one place is something that every manager dreams. And Eventival brings that. No surprises, nothing left to chance! Cons: Very complicated in first usage (like most of the other applications) - but once you're on it - it rocks and rolls. Overall: Our hospitality and accreditation departments efficiency has changed and I don't know how we were managing these departments before Eventival. Pros: Easy to use whenever you are. Cons: Tough start, like any other database. 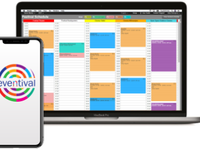 Overall: Eventival helps us efficiently organise guest services for dozens of annual events in various language mutations and for various target groups, and it is also enormously useful when organising the work of our team of six hundred volunteers. Like with every information system, the start may be a little rough, but it has paid off, and Eventival has become a companion to everyone on our team. Pros: Eventival made coordination easier for our team consisting of more than 90 staff members. All festival departments were connected through Eventival and they could access the necessary information whenever they needed, making management more efficient. Cons: Previously I had some issues regarding the user interface but they were addressed already. Comments: We've had a really fast growth in terms of submissions for the Berlin fashion Film Festival. As having to manage everything via spreadsheets became painful, we were looking for a tool to handle the most important processes in terms of managing the films, such as submissions, film-review, judging, etc. We tried out various systems, but with Eventival we feel the safest, especially because of their great, friendly and efficient customer service. On the rare occasions when you might have a question or problem with the system, you will always get prompt replies and solutions. The tech guys at Eventival have also made plenty of customizations for us at a fare rate. The whole Eventival team feels like an extension to our team, and we love having them in the BFFF family. We still don't use all of the functionalities of this cool tool but we will extend this usage as we move on. Comments: Eventival helps us to manage a huge amount of interconnected data to collect, sort and transform the information not only about film projects, but also about events, companies, and professionals. In addition, it is a great support for overall communication with film professionals in the Czech Republic and worldwide. It facilitates the research of specific data, the administration of reminders and many other things that institution like Czech Film Center has to deal with every day. And not to forget, thanks to the copying of data from the database to our website, it helps us build our new online presentation. Shortly it is ready to take from our shoulders the often exhausting and time consuming back office work in large extent. So if we feed the beast properly with correct data, we can free our minds and use our potential and work experience for more delicate tasks. Pros: The ability to customize. The customer service is top notch. Cons: It takes a while to learn the system - need more tutorials. Comments: After five years of using Eventival, it has become an essential tool for almost all our departments, and the festival is running very smoothly with it. Every year, we use it more extensively: this year, we have used the Personal Schedules much more professionally and systematically, in 2017 we plan to integrate our new website with Eventival even better. We also always appreciate the availability and flexibility of the company's staff, and the constant willingness to develop the system further while listening to our needs and demands. Comments: Eventival makes work at such kind of events much easier and saves time! It's easy to use and if one faces any problems the Eventival team is always ready to give you prompt assistance, so you feel safe. Eventival team is always open to a dialogue and it's very easy to deal with them. It's a great database platform which has many opportunities for the companies to work more efficient, but at the same time is quite easy in getting into it. We hope to develop our co-operation with Eventival! Comments: Eventival is a highly customizable database that can solve specific needs of any film festival. Eventival can import profiles directly from cinando solving a lot of the regular data capture problems. Being a online database its perfect to stay connected to the festival from every where you are. Eventival's support team has tended must of our requirements. But the fact that you can customize the platform to your needs is the best feature. Comments: Through Eventival we manage our whole backoffice and link our database to the website. The fact that it is online is extremely useful, as we are an international team working from different places.